Exclusive Mondo T-shirt designed by Jay Shaw included with admission! "Get your stinking paws off me, you damned dirty ape!" There’s nothing like the original PLANET OF THE APES – accept no sequels, knock offs, or re-boots. The original ‘68 simian sci-fi classic endures for a host of reasons: the production design, the makeup effects, Charlton Heston’s hairy chest, the brilliant script and, of course, composer Jerry Goldsmith's iconic score. 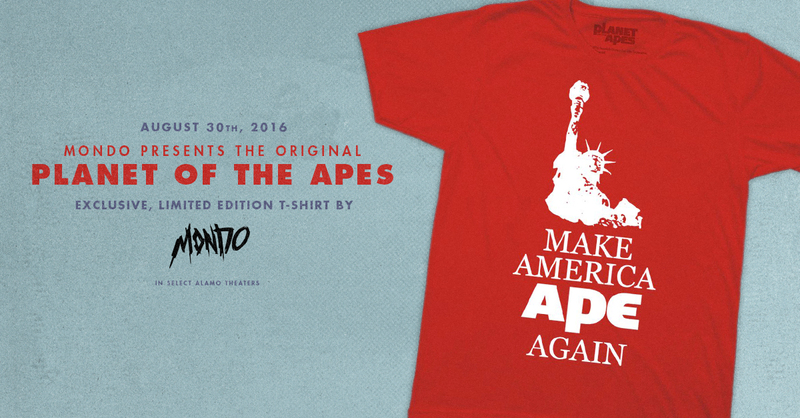 To celebrate the release of their new drool-worthy vinyl release of the APES score, Mondo and Alamo have teamed up to present APES in all its big screen glory for one night only at locations nationwide. Here’s your chance to get your stinking paws ON an exclusive event version of the soundtrack, featuring gorgeous artwork by Matthew Woodson, plus other limited edition APES goodies from Mondo, including pins designed by Tom Whalen and a tee designed by Eric Powell — all for sale in the lobby before and after the show at participating locations!